Mother’s Day is coming up and coincidentally, I happen to be further away from my mum than I’ve ever been. Anguel and I are frolicking in Greece right about now, but thankfully my mum and I got to spend a great day together in the kitchen just before leaving. I think she was mostly there to hang out with the cats – but given she’ll never turn down food, she happily taste-tested soups for our FeedFeed and Vitamix partnership. And frankly, I’m not surprised about where the recipe landed. Potato leek soup has always been her favorite. My mum’s taught me a lot about cooking. Thanks to her, I know how to stir-fry almost anything. And I can quickly triple a recipe in my head, because her portions start at extra-large. I picked up a lot of her habits from just watching her cook. Like the countless times I’d watched her cut the light bottoms off leeks and cast them aside…before carefully stuffing the green ends into her herculean sized pot. Because of this, for most of my life, I would have sworn that you were only supposed to use the dark green part of a leek. It was only until I first read an actual potato leek soup recipe for myself, that I realized she’d been doing it wrong all along! Facepalm. It’s okay mum, you’re still right 99% of the time. I’m happy to report that proper leek prep has now been going strong for a few years now, so it felt only right to celebrate with a soup of our own. And boy, am I excited to share this one! This recipe has all the flavors of a classic potato leek soup, but with some easy “extras” to make it fresh and exciting. Parsnips add a hint of sweet and earthy flavor. It’s a combination I love. We skipped the dairy on this one, which helps lighten up the soup and keep it vegan. And to brighten everything up (it is spring time after all! ), there’s a fresh Chive Gremolata to go with it. The name sounds fancy, I know, but it’s only 4 ingredients and so worth it. If you're not familiar, "gremolata" is a fresh herb topping that's typically paired with meat dishes...but a little known secret is that it can also be used to add a punch of flavour to plant-based ones too! 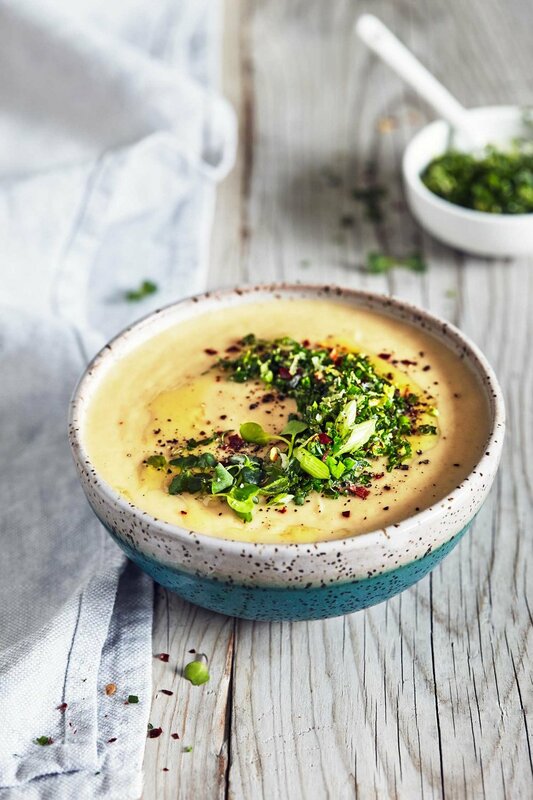 In addition to using the lemon zest in the Chive Gremolata, this recipe also calls for using lemon juice in the soup. A hint of acid really helps to round out the flavors. It makes a difference, trust me. You’ll probably be happy to hear that this soup doesn’t require hours of standing over a hot stove. In fact, it doesn’t even call for a pot! Instead, everything gets roasted in the oven and combined with hot stock before a whirl in the blender. And just like that, you’ll get a silky smooth soup in the blink of an eye. Depending on the size of your blender, you may need to process the soup in two batches. I used the snazzy new Vitamix Ascent 2500 for this recipe, and it all fit in a single go. If you have any leftover soup, it’s best to store it separately from the gremolata. Soup can be reheated the next day, or eaten cold – both are delicious! Chop potatoes and parsnips into similarly sized cubes. Roughly chop onion. Add potatoes, parsnips, leeks and onion to baking sheet. Drizzle with 2 tablespoons olive oil and toss to coat. Slice the top end off the head of garlic. Place garlic on a piece of tinfoil. Drizzle with remaining 2 teaspoons of olive oil, and then wrap garlic in tinfoil. Place garlic on baking sheet with remainder of the veggies. Roast veggies for 40 minutes, or until the potatoes and parsnips are fork-tender. Flip vegetables half way through for even cooking. Once veggies are roasted, add them to a blender. Squeeze the garlic bulb to release the roasted garlic into the blender. Add hot vegetable stock, and then blend until smooth. Be careful when blending, mixture will be hot! Add lemon juice, salt and white pepper. Blend to mix. Serve immediately and top generously with Chive Gremolata. *Potato skins contain both flavor and vitamins, so feel free to use unpeeled potatoes. Peeling the potatoes will yield a lighter colored soup (like the one photographed), which looks a bit nicer and also tastes great. **You’ll need the zest from this lemon for the Chive Gremolata, so it’s best to zest it before juicing it. Add chives, parsley and lemon zest to a small bowl. Stir to mix, and season with salt to taste. Use as a topping for Potato Parsley & Leek soup (or any other dish that could use a herb-y garnish). Any extras should be stored in the fridge covered. This post is sponsored by the lovely people at FeedFeed and Vitamix. All opinions are my own.